6664CCLed Bathroom Ip44 Wall Bracket, Chrome, Cle..
143-WBSimple glass wall light with pull cord switc..
2371-1CCBubbles 1 Light Bathroom Wall Bracket, Bub..
4411CCBubbles Effect Ip44 Led 1 Light Spot - Chrom..
720461 light IP44 flush bathroom wall light. 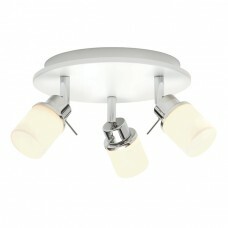 Featu..
726122 light IP44 flush bathroom wall light. Featu..
HADLEY-1WBWHA single wall light featuring a rectan..
1609CC-LEDLima Bathroom - Ip44 (G9 Led) 2 Light C..
68930Sleek curved LED shaver light with an opal pc..
70443Sleek curved LED shaver light with an opal pc..
5372CCBathroom 1 Light - Chrome/white Triangular W..
6014CCPoplar Bathroom Ip44 T5 Fitting 69cmThis ch..
9021CCPoplar Bathroom Ip44 T5 Fitting 99cmThis ch..
8293CCPoplar Bathroom Light - 2 Light Chrome Wall..
96220-WBWHThis wall light has a patterned white st..
51885The Britton is a bathroom wall fitting, finis..
39148The Convesso is a curved wall light with buil..
39363The curved lines of the Ice wall fitting mixe..
EL-257-WBA 2 lamp wall light in polished chrome wi..
39627Intense straight lines and boxy design, combi.. Here we have selected a comprehensive range of ceiling lights, wall lights and mirrors.We approach lighting for the bathroom as a build up from several sources including the ceiling lights (whether that be inset down lighters, a flush fitting or a multi-head fitting), an illuminated mirror and / or wall lights. As lights are generally switched from outside the bathroom or by a pull chord inside the bathroom generally all lights will be controlled from the same switch.Consideration needs to be given to a separate power source for shaver and rechargeable toothbrush and in a number of cases these are integral with the light or the mirror.If you need help to design your bathroom lighting then either visit any one of our stores or call us and we will always help.